A Swansea expert in Alzheimer's disease is calling for better signs in shops and public buildings to direct people back from the toilets. 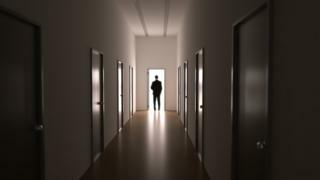 Prof Andrea Tales said people with dementia can feel lost when faced with a corridor of blank doors. She said a simple arrow sticker on a door could help. Dementia Friendly Swansea said it was asking all 1,400 members of Swansea Bay's Federation of Small Businesses to commit to taking this action. Prof Tales, from Swansea University, said that while the way to toilets in shops, restaurants, hotels and leisure centres was often well signposted, on the way back "in far too many premises one opens the door to be faced by an 'Alice in Wonderland' plethora of doors. "As there are often penalties for opening a fire door, it is hardly surprising that many people are afraid to open this door and remain transfixed until someone else enters the toilet." She said she began looking at the issue after meeting a confused and distressed elderly person in the toilets while out shopping. "My aim really was to raise awareness among people who own shops and businesses in public places," she said. Hannah Davies, founder of Dementia Friendly Swansea, said there was "considerable anecdotal evidence" this was a problem, but it could easily be solved. "One thing is to have a sign by the toilets back to the shop floor. It can be a sticker on a door or a printed out piece of paper with an arrow stuck on the door," she said. "The first thing people with dementia suffer from is lack of confidence. They feel they shouldn't go out because of a fear of what will happen to them." Julie Williamson, chairwoman of Swansea Bay Federation of Small Businesses, said they would be publicising workshops with the group to both members and non-members so they can learn about this issue. She said the members she had spoken to so far were pleased to think they would be able to help without it requiring much time or effort. "There's nothing to stop this being replicated across the country," she added.